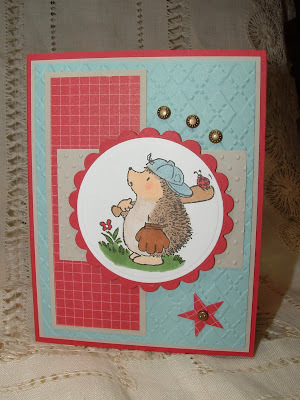 Here is my card for the Stampers Dream Dreamy Challenge. It was a color challenge and we were to use texture and bling. Since I made a masculine card I used some bangle bling that I found clearanced in the jewelry section at M's last year. I really like it on masculine cards! I used a sketch from over on the Stampin' Out Alzheimer's site. I really like this color combo and will use it again! I used a combo of prisma's and copics on this image. I just can't get hedgies or mice to look right with copics. Oh my goodness is this ADORABLE! Love it! Awww!! Now this is just darling!!! LOVE the texture! And your little star is just so sweet!! Oh Janice, this is so adorable! I have this same stamp and he's just the sweetest, isn't he? I think your coloring looks fabo! Nicely done! FANTASTIC card, Janice!! This hedgie is PERFECT for the colors. LOVE the card, girl! Oh this is so sweet!!! I love that image, and the colours are perfect! Well done! Too cute, I love the image, sweet! !